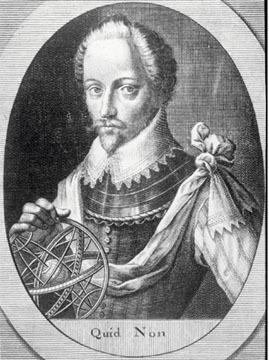 Marsh, James H.. "Sir Humphrey Gilbert: Elizabethan Explorer". The Canadian Encyclopedia, 25 January 2019, Historica Canada. https://www.thecanadianencyclopedia.ca/en/article/sir-humphrey-gilbert-as-near-to-heaven-by-sea-as-by-land-feature. Accessed 21 April 2019. On 5 August 1583 Sir Humphrey Gilbert assembled the reluctant fishermen of St. John's harbour in front of his tent. In a brief ceremony he proclaimed that the land thereabouts now belonged to England, and that he would be its governor. Whatever we might think today of the legitimacy of Gilbert's presumptuous claim (the local Beothuk would have been perplexed had they been informed), it changed the course of Canadian history. Gilbert came to his calling naturally. His boyhood was spent among a galaxy of famous relations taking part in the seafaring adventures of the times. He noted the voyages of Martin Frobisher and in his own treatise speculated on the existence of a northwest passage. Though his geography was mostly preposterous, he managed to persuade Queen Elizabeth I to grant him the sole right to establish an English colony in "heathen lands not occupied by any Christian king."
Gilbert's first expedition, in 1578, was ambitious. It included 10 ships and over 500 men. But it came to grief, dispersed by gales and forced to return to port. Gilbert lost the greater part of his personal fortune. Nonetheless, he persevered. Gilbert organized a second expedition in the spring of 1583. The Queen urged him, as "a man noted of not good happ by sea," to stay behind. It was good advice, but he did not take it. The little fleet left port on 11 June 1583. One vessel turned back, but the others kept company on a slow crossing. The Golden Hind, Swallow, Squirrel and Delight were separated in the ubiquitous Atlantic fog but managed to reconnoitre at the mouth of St. John's harbour on 3 August. The Portuguese, Basque, French and English fishermen tried to deny Gilbert passage, knowing that there were numerous pirates among his crews. Gilbert brandished his royal commission and the fishermen gave way. After his ceremonial claim, Gilbert sent two of his ships directly home and led the others into the treacherous waters off Sable Island. After a windy night, the ships found themselves in shoal water on the morning of 29 August, and the Delight's crew, keeping a poor lookout, were unable to prevent her going aground and rapidly breaking up. Most of the Delight's crew perished. The loss demoralized the remaining men and Gilbert decided to head home. He refused to leave the Squirrel, even though the captain of the Golden Hind warned that she was over-gunned and unsafe. Nearing the coast of England, the two ships encountered heavy seas. On 9 September, the Squirrel was nearly overwhelmed but recovered, and in a calmer spell Gilbert hailed the Golden Hind. He was sitting towards the stern and called out "We are as neare to Heaven by sea as by land."
The image of Gilbert reading aloud from More's Utopia, "He that hathe no grave is covered with the skye," as he is swept overboard is one of the most dramatic of the entire Age of Exploration. At midnight 9 September the Squirrel's lights went out; and at that moment "the Frigat was devoured and swallowed up of the Sea. " The Golden Hind reached Dartmouth on 22 September with the tragic news. Sir Humphrey Gilbert was one of those Elizabethan adventurers, like Sir Francis Drake or his half-brother Sir Walter Raleigh, who are hard to evaluate. Part visionary and part pirate, brave and cruel, determined to the point of obsession, Gilbert was a man whose dreams outpaced his means to achieve them. Nevertheless, even in today's historical fashion of ignoring the feats of individuals, it is difficult not to acknowledge those, like Gilbert, who changed the course of history by sheer willpower. Gilbert failed himself to establish a colony in the New World, but he firmly planted a seed that within a few generations grew into a full-scale English presence in America.